The coldest air of the year and possibly the Winter 2018-2019 season has descended southward toward the East Coast, can create life-threatening situations for those who lose power and cannot heat their homes. Wind chill warnings and advisories have been posted by the National Weather Service from the Midwest into the mid-Atlantic, upstate New York and New England. "After a strong winter storm impacted the East this weekend, cold air has spilled in behind this system. Temperatures Monday morning were in the single digits above and below zero across New England with teens above zero as far south as North Carolina. This, combined with gusty winds is making it feel even colder. 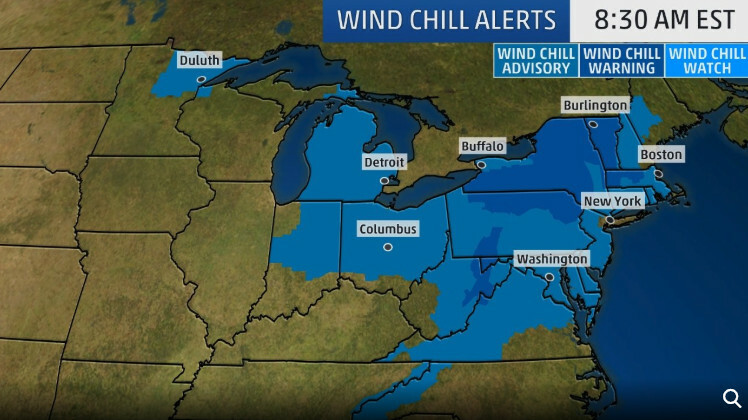 As such, wind chill advisories and wind chill warnings are in effect across the Northeast as it will feel below zero through the Martin Luther King Jr. holiday. This will have an impact on the ski resort industry, with some mountains electing to close due to the adverse weather conditions,"
Meteorologist and owner of Empire Weather LLC., Ed Vallee. 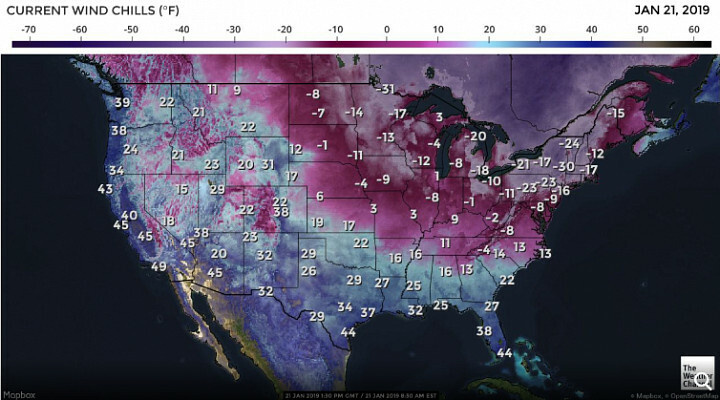 Wind chills were below zero Monday morning in New York City, Boston, and Philadelphia. Interior locations such as Buffalo, New York, and Burlington, Vermont also experienced wind chills in the 20s below zero. Subzero wind chills were even reported as far south as Asheville, North Carolina. Monday's highs are likely to hold the low teens along the Interstate 95 corridor that stretches from the Baltimore–Washington metropolitan area to Boston. Although this arctic blast is expected to only last until late Tuesday in most locations, it signals the start of frigid conditions to end the month for the Northeast. 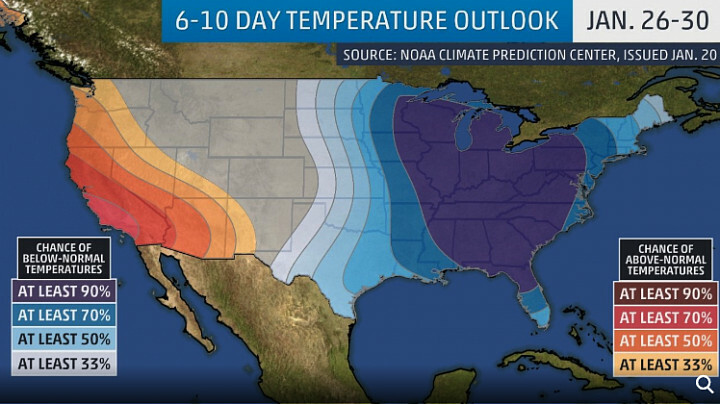 NOAA's 6- to 10-day weather model illustrates portions of the central and eastern states are expected to see below-average temperatures Jan. 26 to Jan. 30. 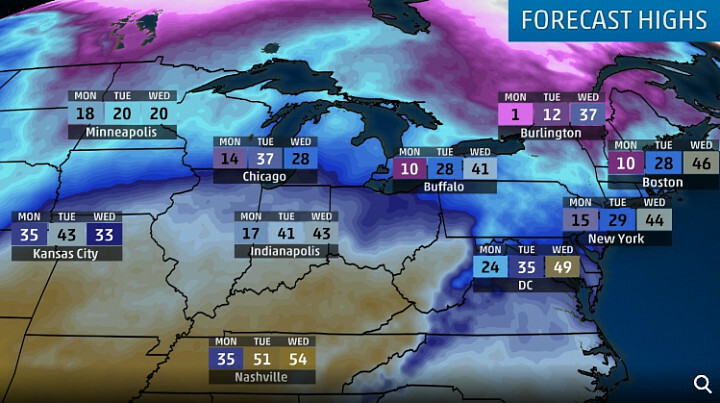 Models are also indicating that the next shot of arctic air could arrive into the Midwest starting late this week. For more color on just how cold it is this Monday, Wildcat Mountain Ski Area located on Wildcat Mountain near Jackson, New Hampshire, is closed today due to "extreme cold & high winds. Temps predicted to be -15 to -20 below at the summit, w/winds 35 - 50 mph + gusts to 60 mph. Unbearable!"